Commercial, Hotels, Residential & Resorts and more. Carpet Cleaning Henderson - The Best Clean Guaranteed! Carpet, upholstery, rug and tile & grout cleaning. Eliminate any pungent odors with our FREE Deodorizer. It is not overly fragrant. Client satisfaction and a great experience is what clients witness with Ecodry. Straight forward pricing with no hidden fees. Don't be scammed with competitor low price deals. Why use Ecodry Carpet Cleaning of Henderson? Not like any carpet cleaner, we are HOST® certified and a premier Green Seal company. The main difference is our cleaning techniques. We use 100% plant based cleaning solutions that not only give floors a deeper clean but it also makes it healthier. We are locally owned and one of the longest-running carpet cleaners serving Las Vegas and Henderson, NV with 35+ years. Our brand and service is recognized as a high-standard and top choice for commercial managers and residents. If you have an apartment, home, hotel or commercial office just North of us. We have a second location that is closer to you. Anyone that needs the finest carpet cleaning Las Vegas service at a competitive price, visit our Las Vegas page and prepare to be impressed. When most people think of carpet cleaning, images of wet carpets, steam, chemicals and hours of waiting for it dry conjure up. Here, HOST® is an all-natural dry carpet cleaning system. All furniture will be dry within minutes - not hours. Using HOST® Aridex, we are a leading choice for casinos, hotels, resorts and offices because there is no over-wetting, no sticky residue and no shrinkage. WoolSafe Approved and effective to use on all types of area rugs and luxury tapestry's. Using Air Cell Extraction™ technology, we are capable of deep cleaning and rejuvenating any area rug at your location in very little time. 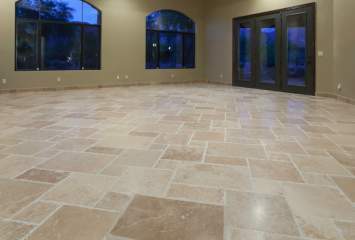 Easily cleaning grouted and textured floors with no downtime, harsh/toxic chemicals or fumes. It's quick, easy and dry for all types i.e. ceramic tile, granite, brick, quarry tile, epoxy, concrete, limestone, rubber, LVT and so much more. & Ecodry Is Certified Doing It! When first-time customers see our results, they are amazed! Our cleaning not only cleans deeper but it also dries faster. Plus, the dry extraction process for both commercial and residential sites is good for cleaning area rugs, carpet, hard surfaces, upholstery, tile and grout. 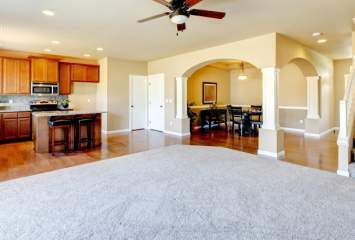 Our family friendly staff and technicians ensure that each carpet cleaning Henderson NV client gets the best clean and the best customer satisfaction. You are going to love our revolutionizing way to achieve the best clean that makes any floor look its best every day. See it to believe it! Play the video to learn the most certified floor cleaning system in the world. Certified green and anti-resoiling all types of carpet while conserving water and energy usage. "I have known and trusted this business for 4 years. I highly recommend their carpet cleaning service. They take great pride in their work and are environment friendly. Cheri @ Farmers Insurance"
HOST® Certified Carpet Cleaners Are In Higher Demand Than Truck-Mounted Carpet Cleaners. Award-winning cleaning starts with the right staff using the best Henderson carpet cleaning machines and solvents. Using the HOST® cleaner, our technician can easily dissolve and absorb any trapped soil, stains and odors. We then finish the process by vacuuming the complete area, leaving the carpet dry within a few minutes. New advancements in our machines leave floors looking like-new and smelling brand new. Using only Green Seal approved products, our HOST® DRY systems allows us to be the most preferred carpet cleaner in Henderson and Boulder City, NV. Our free demo-clean is supported by our service satisfaction pledge. Proudly Serving Carpet Cleaning Boulder City NV Locals Too! 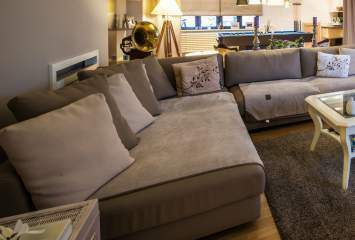 Why Should I Choose To Have My Carpets Dry Cleaned? Would you wash your expensive suit in a washing machine? Of course not, you would have it professionally dry-cleaned. HOST® is the principle by not using gallons of water or damaging high-pressured truck-mounted vacuum suction to clean carpets. Without the use of heat, steam and too much water, there's never any shrinkage, color-loss or over wetness. When comparing to truck-mounted carpet cleaners, we are the smarter choice. What Our Clients Say - Many of our customers love the post-results that we reveal, along with the ability of walking on the carpet immediately. Our clients also love the clean, fresh and not-overly powerful fragrances of HOST®. Our Reputation - With over 30+ years in business, Ecodry has become one of the best known and respected names in carpet cleaning. With our services you will get no; downtime, harsh chemicals or fumes, Green Seal® Certified cleaning, and a clean that lasts. Four Simple Steps To Our Carpet Cleaning - First, certified Ecodry technicians vacuum the area to remove any debris, dirt and dry soil. Second, we apply HOST® dry solvents to the area so that our machine can naturally brush, dissolve and absorb the stains and soiling. During this brushing process, also known as the 3rd step, we use a proprietary passing method that confidently overlaps the service area. The final and fourth step is then carried out by using our vacuum unit to help revive and uplift the carpet fibers and any remaining dry-solvent particles. Most of our new-customers are those that leave this type of methodology because the cleaning results are not as effective and once dried, it usually leaves the carpet crunchy. Why is Ecodry The Best Choice? There is no downtime. Meaning, all offices and public areas can remain open during the cleaning process. Unlike truck-mounted carpet cleaners in Henderson that require up to 12 hours or overnight drying time, our services provide immediate results that leave the carpets dry within minutes after the service. This means, our technicians can clean anytime of the day. A second benefit of our cleaning is that carpets stay cleaner longer because there is no wetness or sticky chemicals leftover. With everything dry, the carpet repels intial foot traffic and fresh soil marks. The third benefit is how ECO-friendly and Green are services are, which makes it safe for children, pets, health and the environment. What Cleaning Method Does The Competition Use? Well there are typically 4 different methods. The most common method is "Steam" cleaning. In other words, Hot Water Extraction. This method uses a heated pressurized system that cleans over the heavy alkaline chemicals that the technician sprayed to remove spot soils and traffic stains. The most common issue with this, is that the carpets become soaked and too wet. If you are lucky the competitor will use air blowers to dry the area quickly but more often that not, the technicians quickly packs-up and leaves the scene. Leaving you behind with over wet carpet and all interior ceiling fans turned on HIGH. A second method is carpet cleaning with the use of a Rotary Pad. This method uses a machine similar to a floor buffer that has a spinning pad connected at its base. Using harsh chemical sprays to pre-treat the markings on the carpet, the spin brush then rotates as it absorbs the soil. Once the base pad is full of dirt, it gets replaced with a cleaner buffing pad. Usually the replacement cleaning pad is a reused buffer that has been rinsed with water and dried. Ultimately, this system distorts the twisted carpet fibers and easily transfers dirt as it passes new areas. Another two disadvantages; the technicians will virtually not have any control over the amount of cleaning detergent being used and once completed, the carpet will rapidly regain soiling due to its wetness. A third method is the "Dry Foam Method". Here, a technician uses high alkalinity detergents and solvents to create a foam that will be applied to the carpet. Then, a scrubbing machine passes over aggressively. Depending on the competitor's methodology, the use of a vacuum might be needed to pass-over the area to collect any residue. This method is similar to the rest as it over-wets the carpet and long-drying times is needed, which leads to rapid resoiling and fiber shrinkage. The last method is with the use of a Rotary Brush. Similar to the Rotary Pad method, rotating brushes are used to scrub the fibers and the wetness is then extracted into a small tray attached to the machine. This method is predominately used to clean hard floors, but when used on carpet. It easily distorts the natural twisted fibers and causes pile distortion. Once finished, a long waiting period is needed for the carpet to become fully dried.